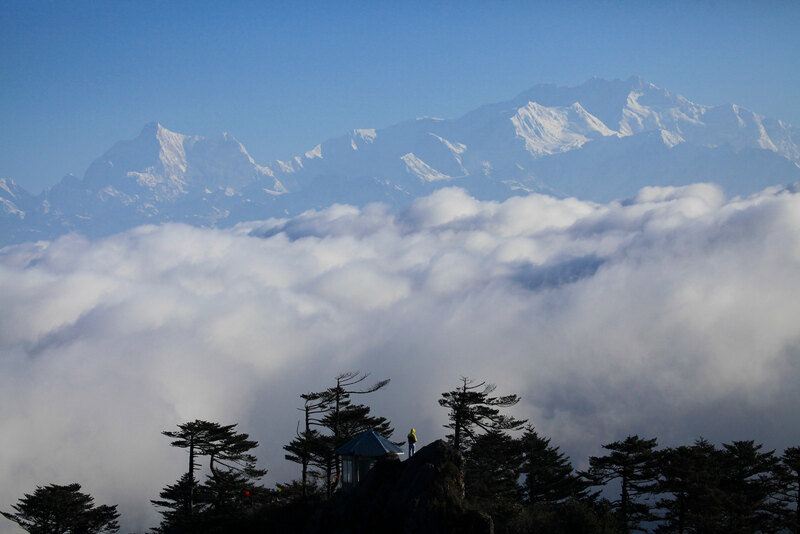 Sandakphu Phalut Trek or Singalila Ridge Trek is one of the best treks that offer breathtaking mountain views. 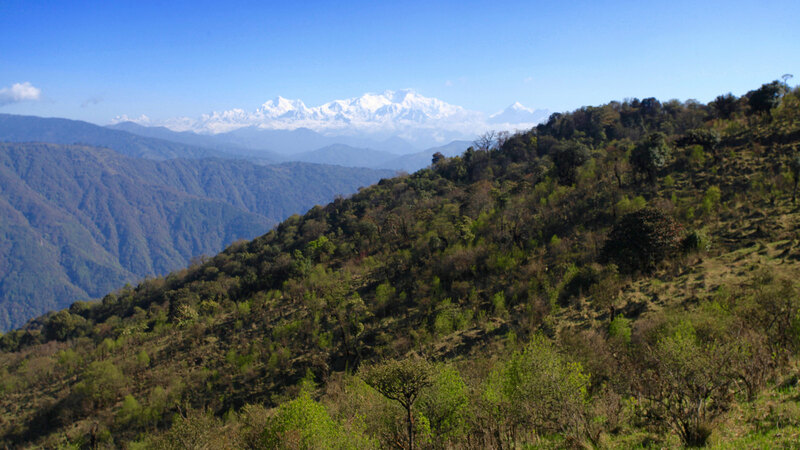 It is the only trek in India where one can see Mt. 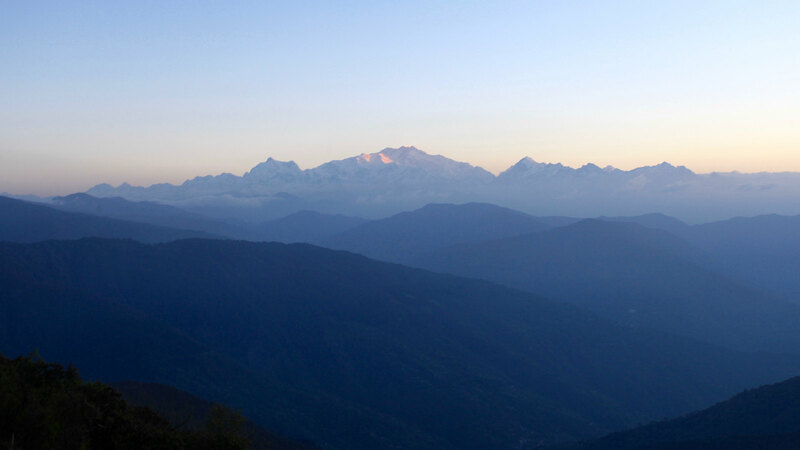 Everest (Tallest), Kanchenjunga (Third), Lhotse (Fourth) and Makalu (5th) together in a single frame. 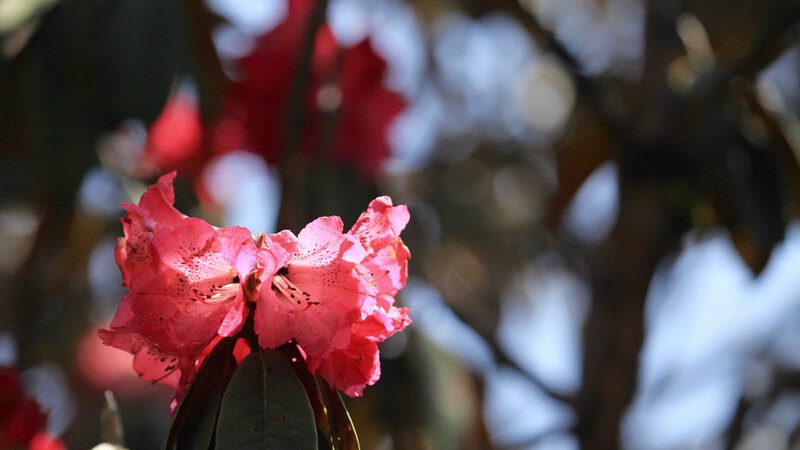 Spring months are great for trekking as days are longer with beautiful rhododendrons along the trail and warmer nights. However you have to be lucky to get views as clear as winter months. 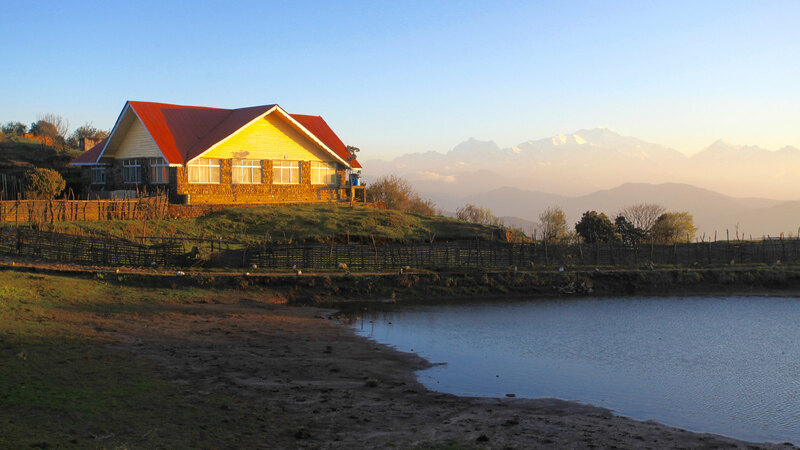 Sandakphu is the highest point of West Bengal and is at 3636 m above sea level. 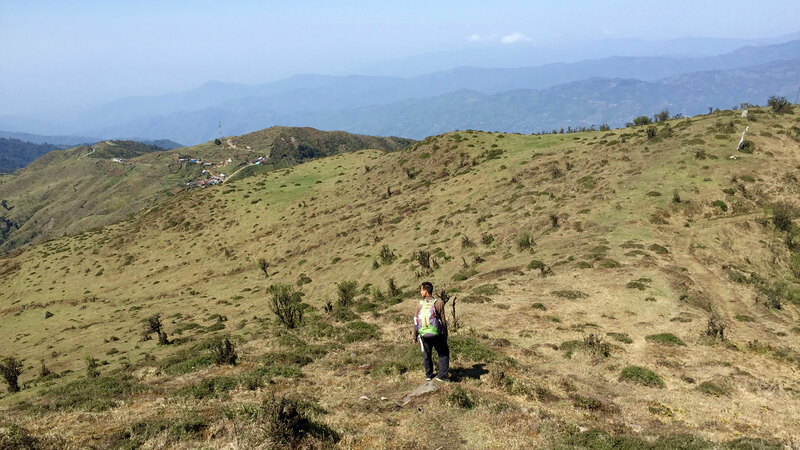 I did this trek in 5 days between Manebhanjyang – Tonglu – Sandakphu – Phalut – Samanden – Srikhola from May 1 -5, 2017. 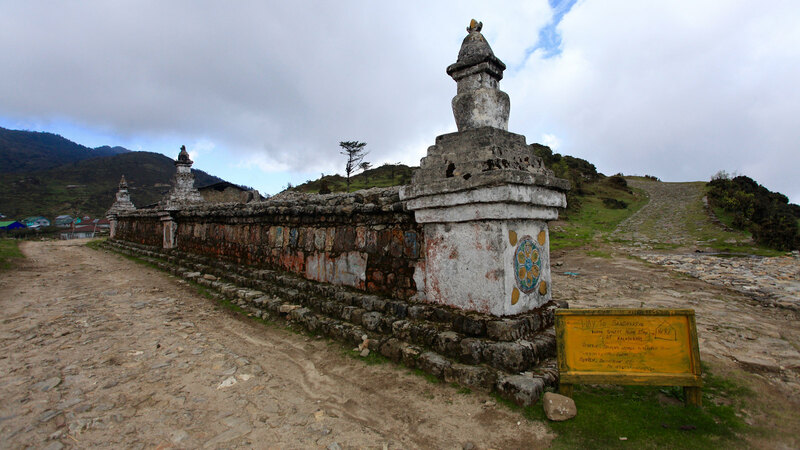 Live through our trek story below and more useful information and how to do this trek and other useful information. 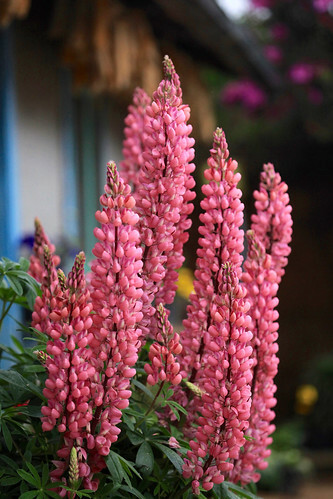 The Darjeeling Mail arrived 1 ½ hr late at New Jalpaiguri Station at 9:30 AM. 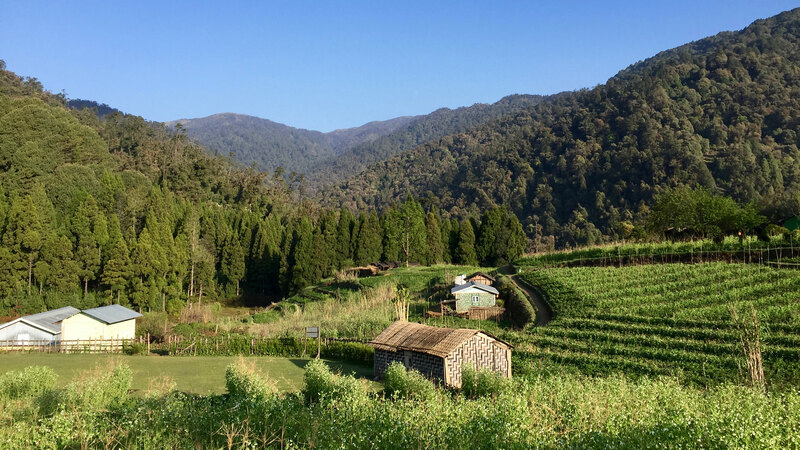 I took a shared auto to Tenjing Norgey Bus Stand from where it is possible to get shared taxi to hills. The shared taxi does not goes directly to Manebhanjyang. Hence i took a taxi to Darjeeling and got down at Ghoom. From Ghoom i took another taxi to Sukhiapokhari and then changed for the final time to Manebhanjyang. I reached Manebhanjyang at 2:00 PM. While the heat was killing in the plains, the mountains are cool and misty. Being late, i was unable to get a guide from the office of the Singalila National Park. You have to be present before 2 PM to get a guide and start the trek. However i was in no mood to stay at Manebhanjyang. I met Mr. Bisht from Uttarakhand also looking for a guide. We started the trek together without a guide, with an assurance from the office that the guide will meet us tomorrow morning at Tonglu. The trek finally started at 2:30 P.M. with drizzling rain accompanying us. 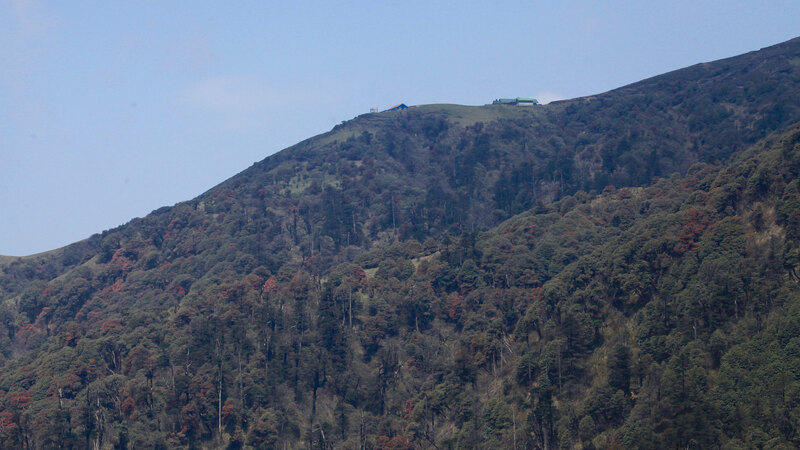 The initial stage from Manebhanjyang (2130 m) to Chitrey (2480 m) is steep and short. 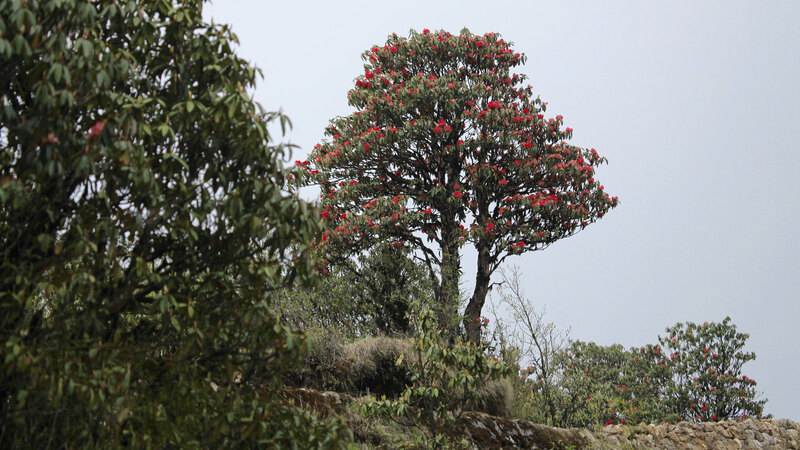 The rain started pouring and it became difficult for us at the very onset of the trek. 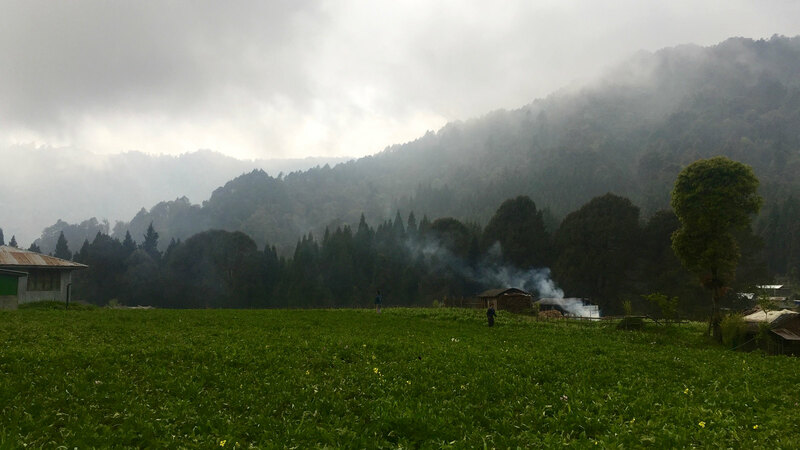 After an hour we reached Chitrey and took shelter in a teahouse. A hot cup of tea and noodle soup was very much needed. At around 4 PM the weather cleared and the sun appeared again. 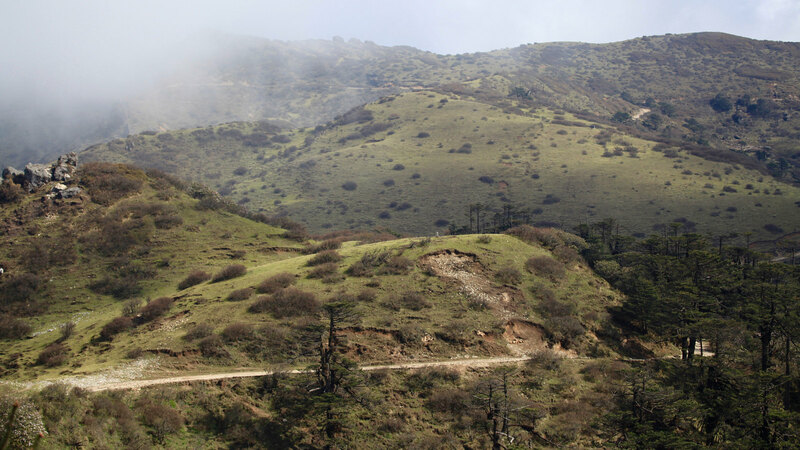 We started again towards Tonglu. 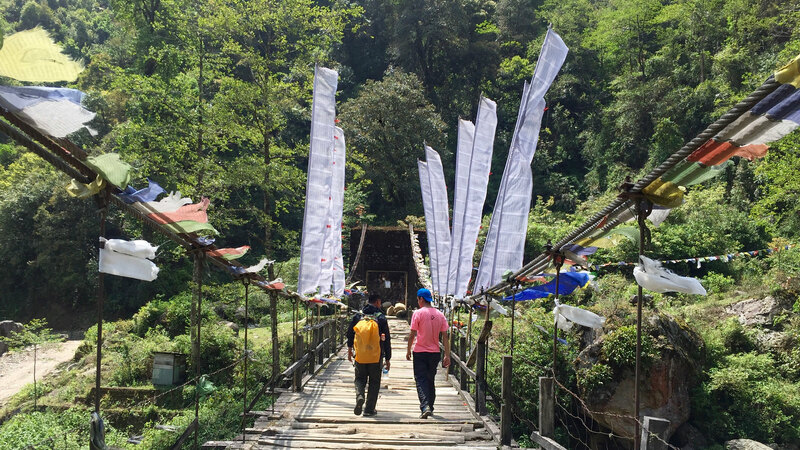 At 4:45 PM we reached a small hamlet in Nepal, Lamaydhura. 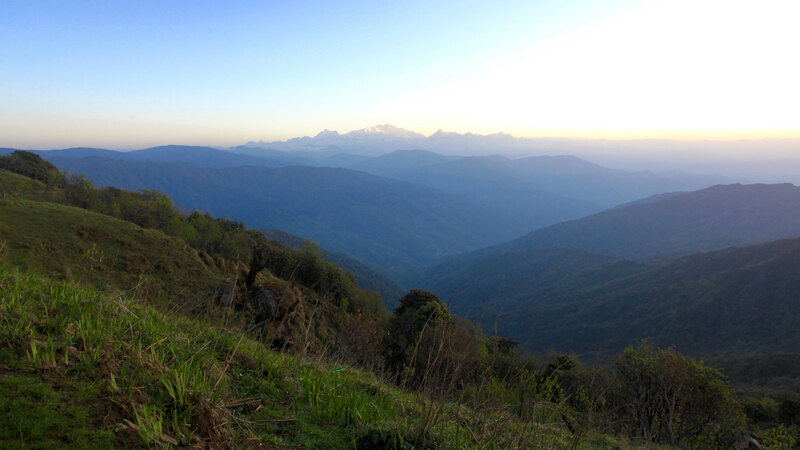 We did not stop and continued further towards Meghma (2900 m) and Tonglu (3100 m). 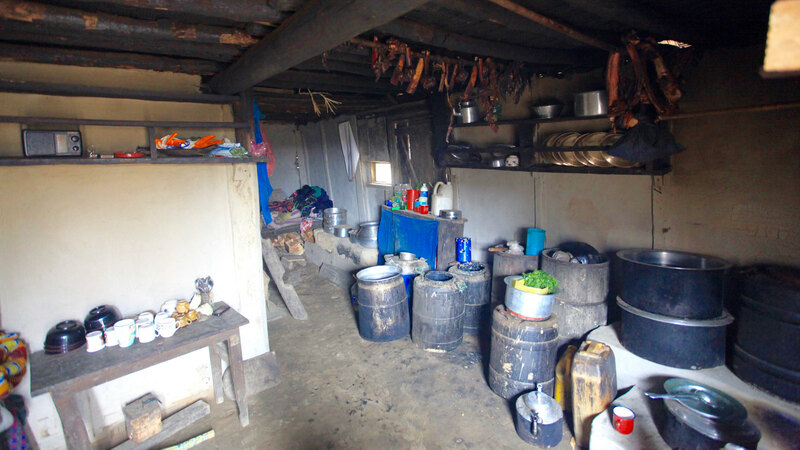 We reached Tonglu at 6 PM and found that no bed is available in the trekkers hut. 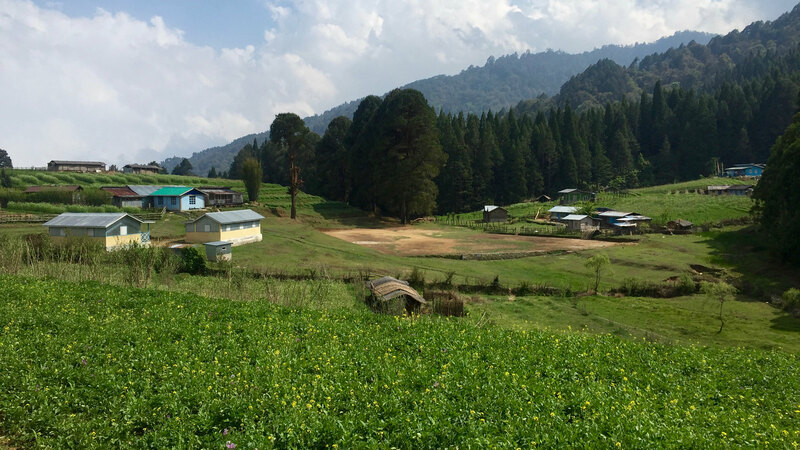 There is a district magistrate hut near the trekkers hut and i got a room there at Rs 450. The day was too long and after a nice hot dinner ( Bhat, Dal, Vegetable and Egg Curry) i ended flat in bed. Tomorrow hoping a clear nice sky and a brilliant sunrise over sleeping Buddha. I had set alarm at 4:30 AM. 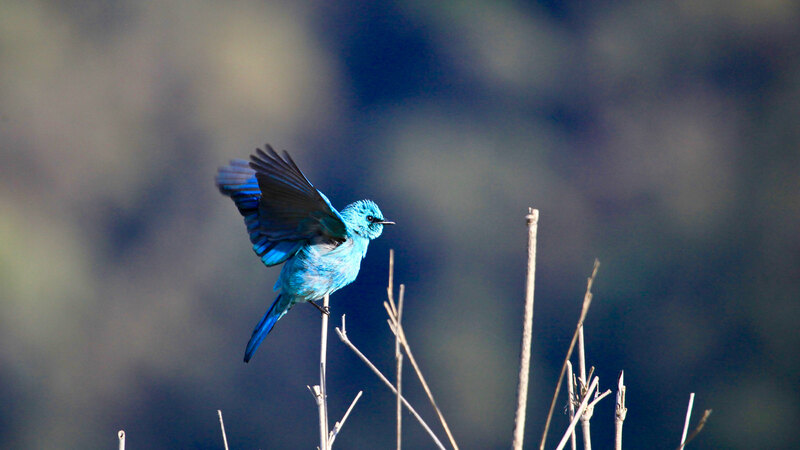 After seeing light outside and clear sky, i woke up Mr. Sandeep who was in the next room. The outside was cold and the wind was making it difficult to stand. The views of Mt. 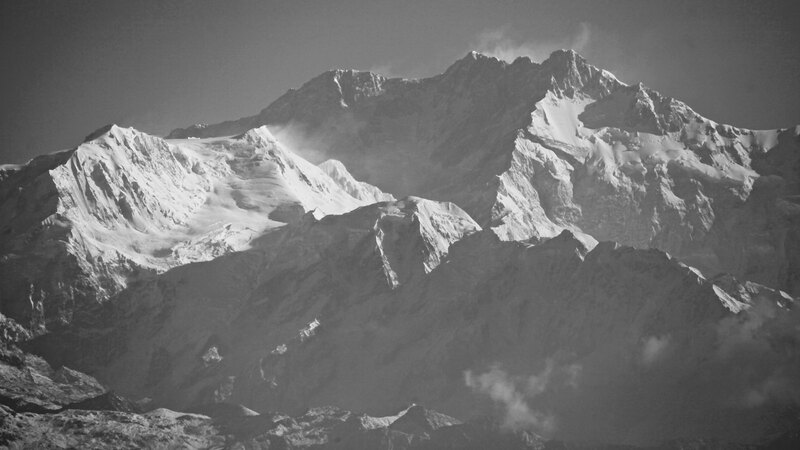 Kanchenjunga was breathtaking. I took refuge behind a concrete rain shelter and gazed in awe in the brilliant views and sunrise unfolding in front of me. I again started walking at 7:30 AM after breakfast and then crossed Tumling (2895 m) to reach the checkpost at 8:00 AM. Without guide i was not allowed to go further. The officer tried to contact the office at Manebhanjyang but the phone network is poor here. 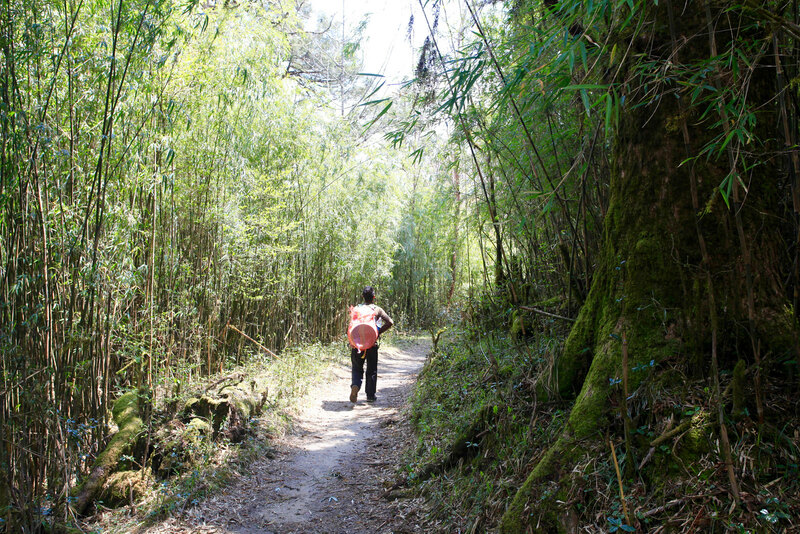 Then all of a sudden our Guide Mr. Yogen Tamang appeared out of nowhere in the trail. He started from Manebhanjyang in the wee hours of morning and reached here with a ride in the jeep. Now we three started and took the higher jungle trail leaving the dart road behind us. 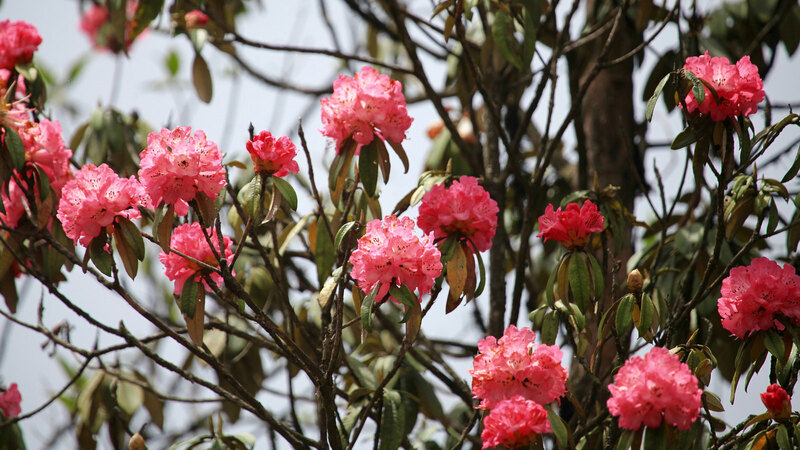 We crossed over dense forest of rhododendrons with views of Kanchenjunga in the front. 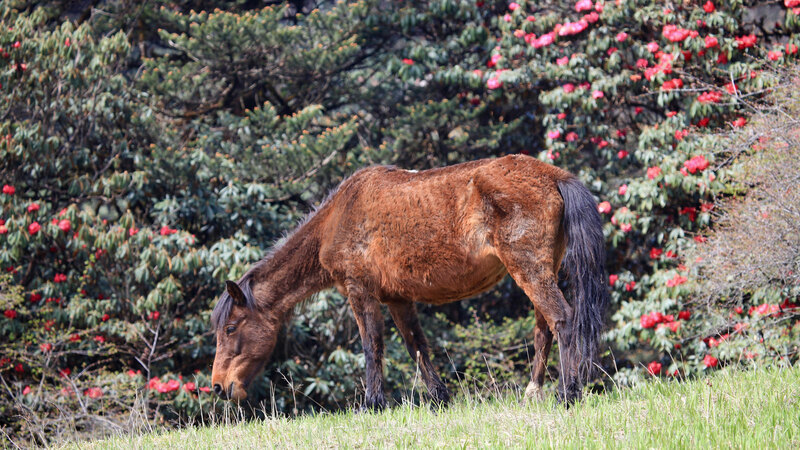 The short route took us over the village of Jaubari (2900 m) in nepal in half hour (9 AM) to the army post of Gairibas ( 2525 m ) seated in the bowl between the peaks of Tonglu and Sandakphu. 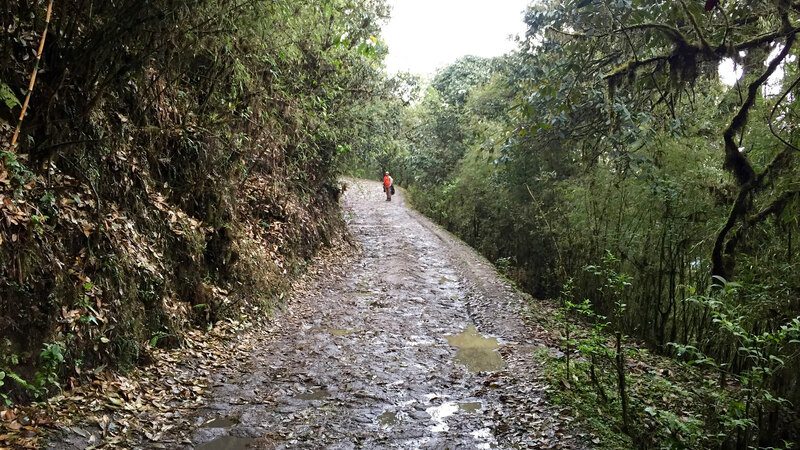 We reached Gairibas at 9:45 AM and the route from Tonglu to Gairibas is all downhill. I decided to have tea here before moving ahead. 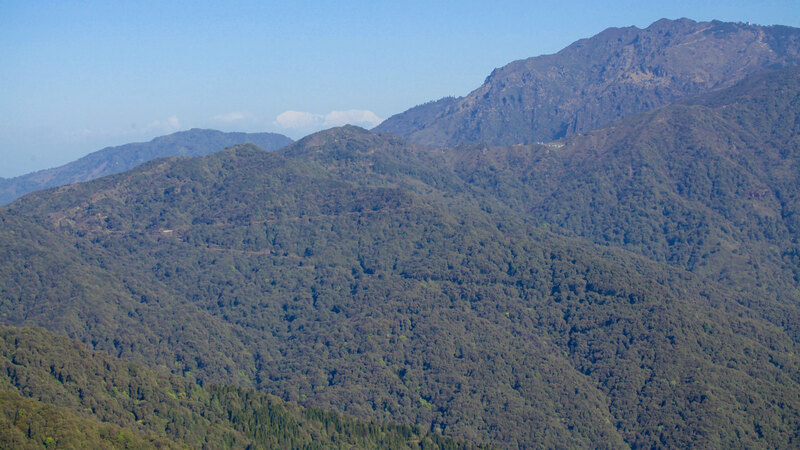 From Gairibas to Kalipokhare ( 3100 m) is all climb through steep steps and in between smooth dart roads and jungle trails. 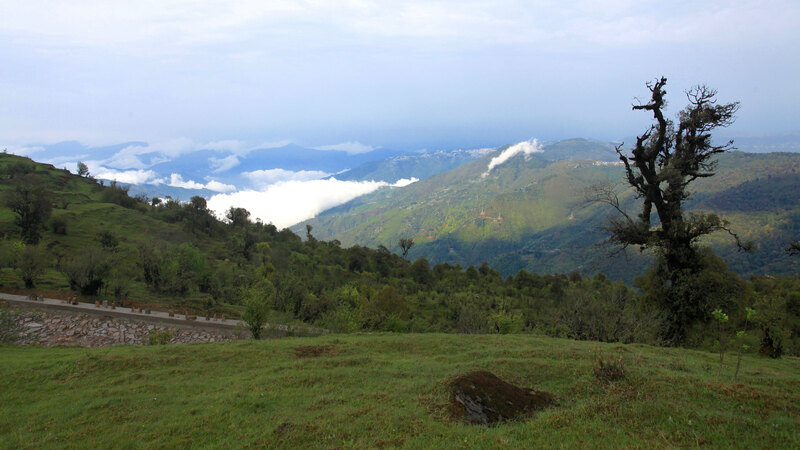 The views have vanished in this part of the trek and weather is again cloudy and misty. It was 1 PM when we reached Kalipokhare and had lunch. There is phone available here although a nepal number. A call to India will be a international and costs Rs 20 per minute. 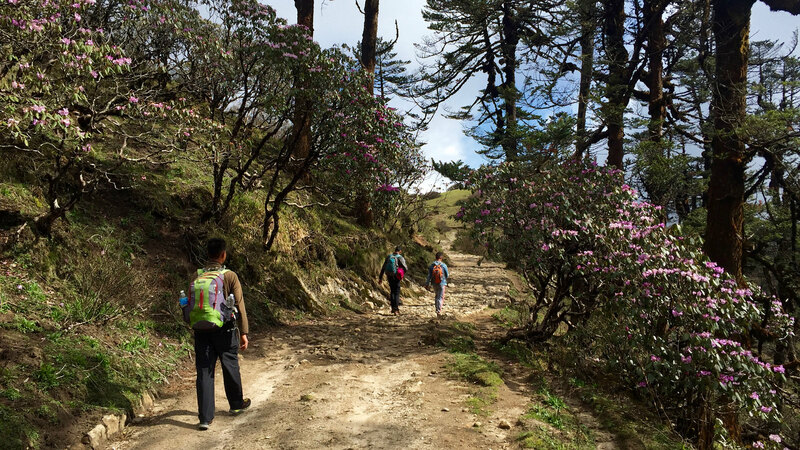 After hot lunch ( Dal, Bhat, Vegetable and Omlette) we again started the climb further to Sandakphu. 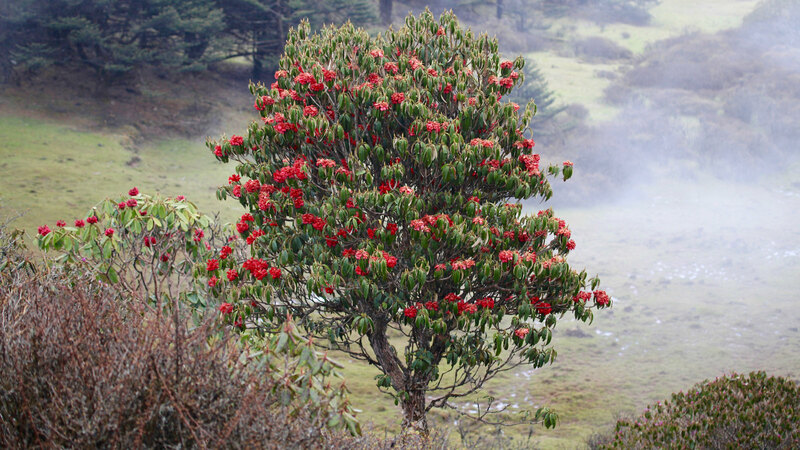 From here to Bhikay Bhanajnag (3200 m ) is a level walk for an hour through rhododendron trails. 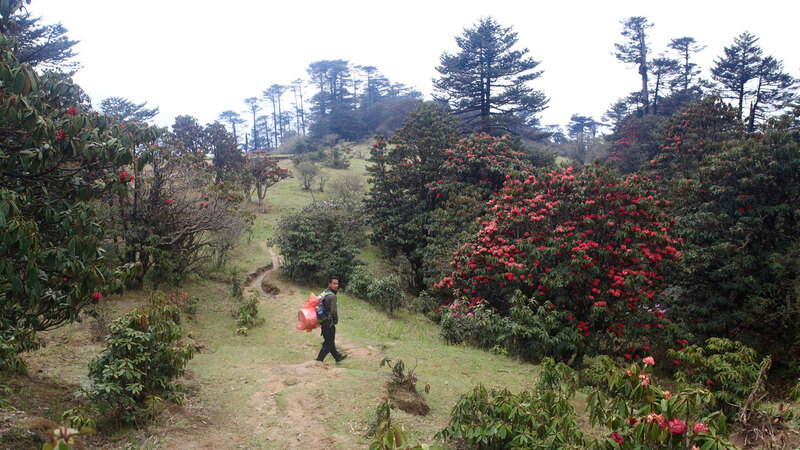 I stopped there for a tea again and then the final steep or i should say very steep climb to Sandakphu (3636 m). After a draining climb finally at 3 PM i reached Sandakphu. Mr. Bisht is super fast and has reached Sandakphu at 2 PM. 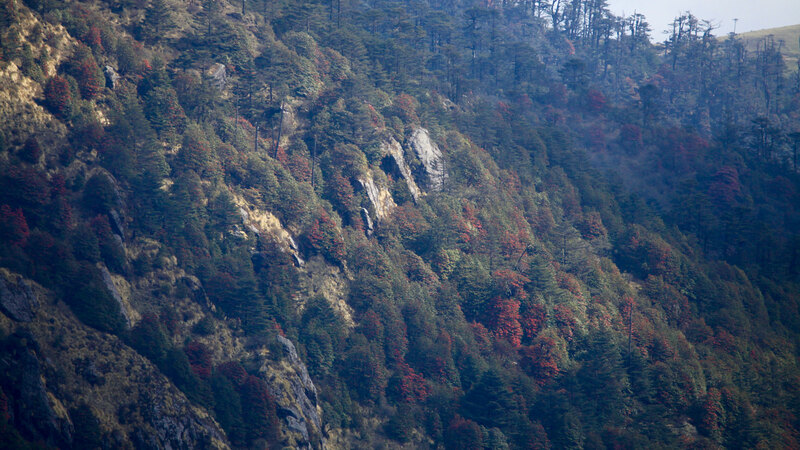 This being peak travel season, there are no rooms in the trekker hut as usual. We got a room for Rs 900 for 3 beds in a homestay in nepal side. The weather never cleared till night and pretty much at 4 PM i went to sleep to be woken up again at 7 PM for dinner. I was too tired to get out of the warm bed, and hence ordered only bread butter and a glass of hot milk. First light on Sleeping Buddha. 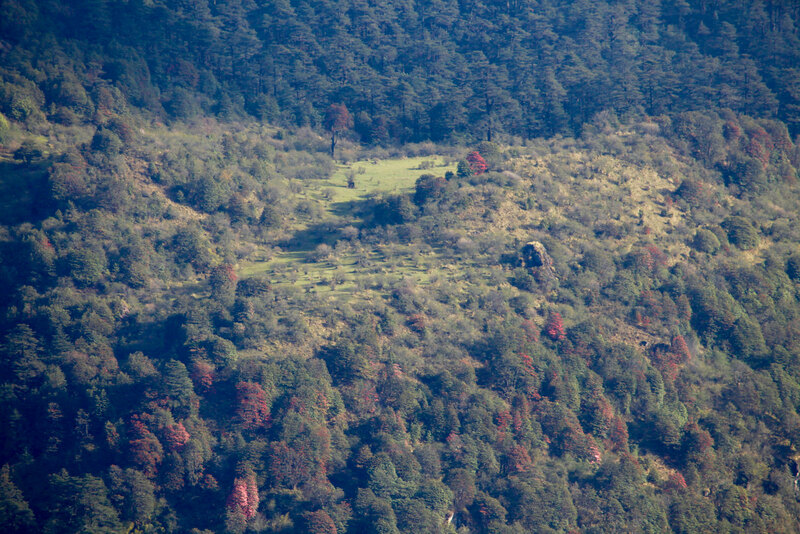 View of Sleeping Buddha from Tonglu. Looking east and down towards Dhotrey. 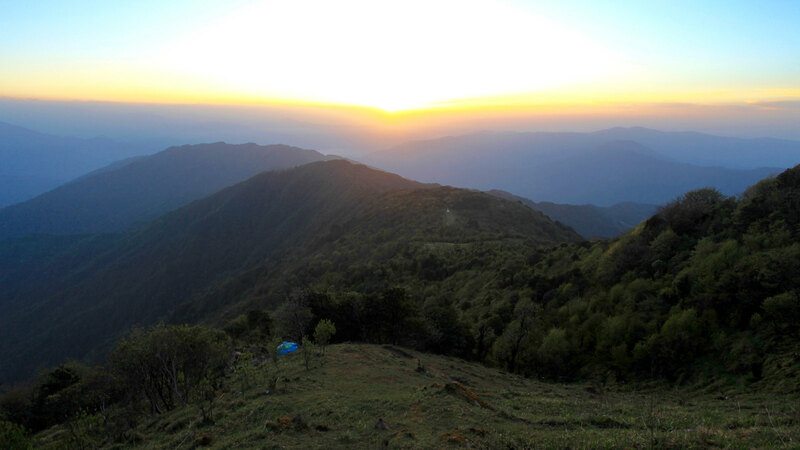 Tonglu trekkers hut at sunrise. 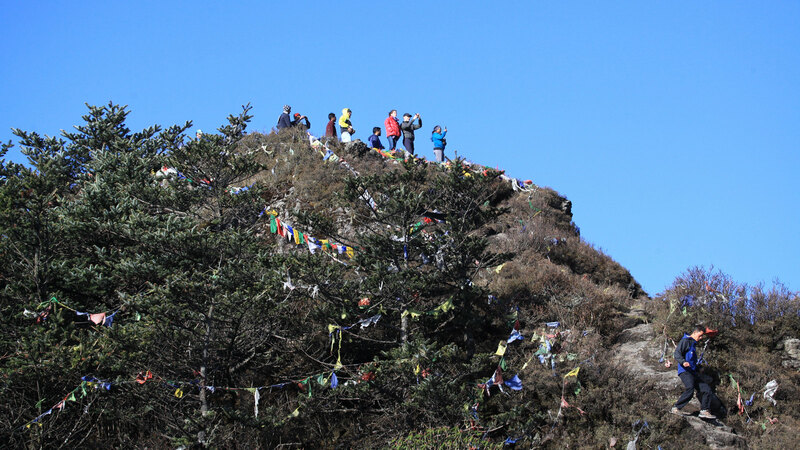 Hikers looking at Sleeping Buddha. 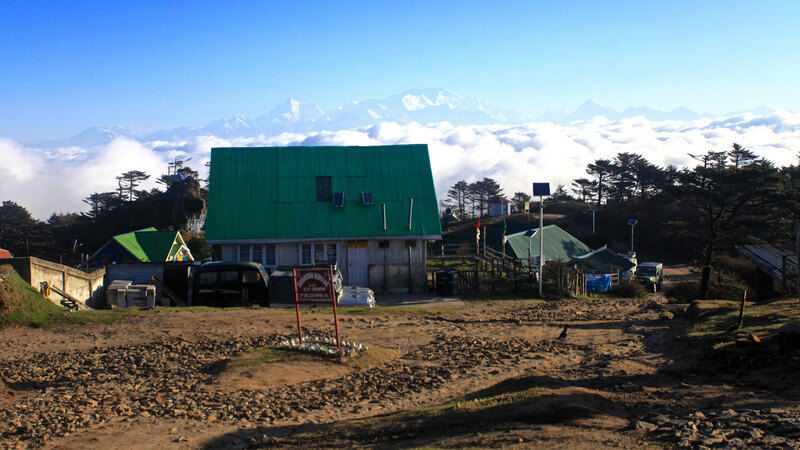 Sandakphu as seen from Tumling. Down towards Gairibas and Nepal on left side. 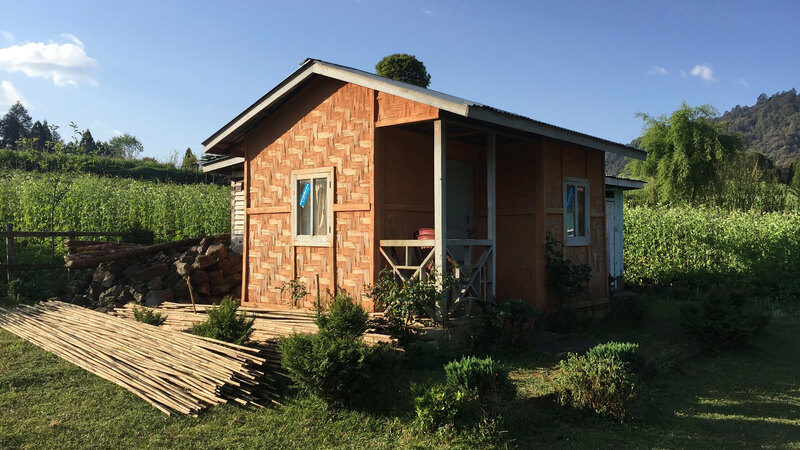 A house at Bikheybhanjang. Thats Yak sausage hanging on the roof. 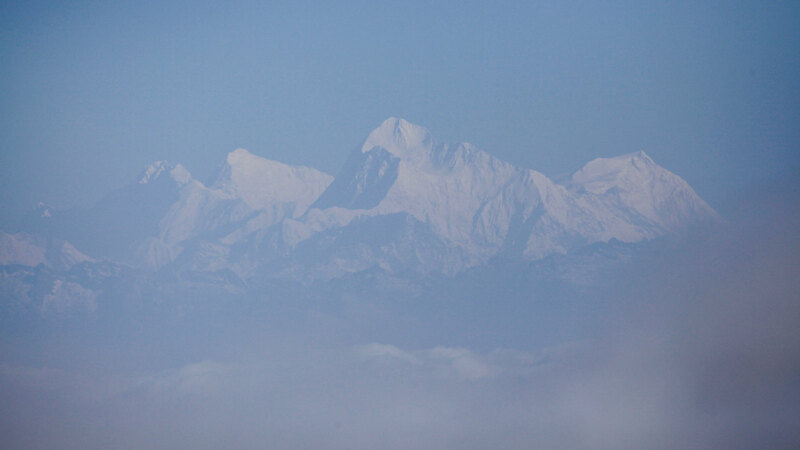 I woke up at 4 AM but the weather was still bad as it is possible to see Kanchenjunga from the bed itself. At 6:30 AM the weather cleared up suddenly and i rushed to the hill top for the views. The famed views of the 4 of the 5 tallest peaks are right in front of me. Everyone around was ecstatic with joy of the fine views. We could see Phalut (3600 m) our next stop well under the clouds. By 7 i finished my breakfast and got ready for the trek ahead. 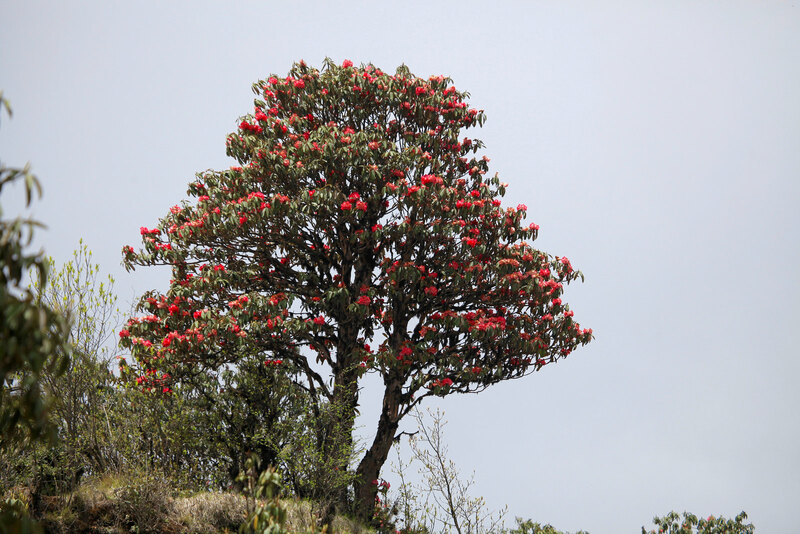 Mr. Bisht started today at 5 AM with a plant to reach Phalut-Gorkhey-Srikhola in a day and depart for home tomorrow. So we parted ways while i was still in bed. 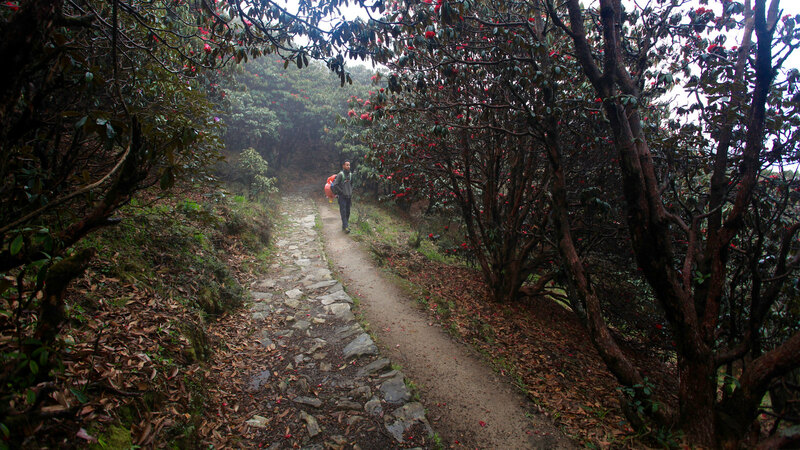 The Sandakphu Phalut trail is pretty much level walk with intermittent steep up and down trails. After 1 ½ kms walk we reached a small village ( few homes) Aal. The views of the peaks have already disappeared in the clouds. 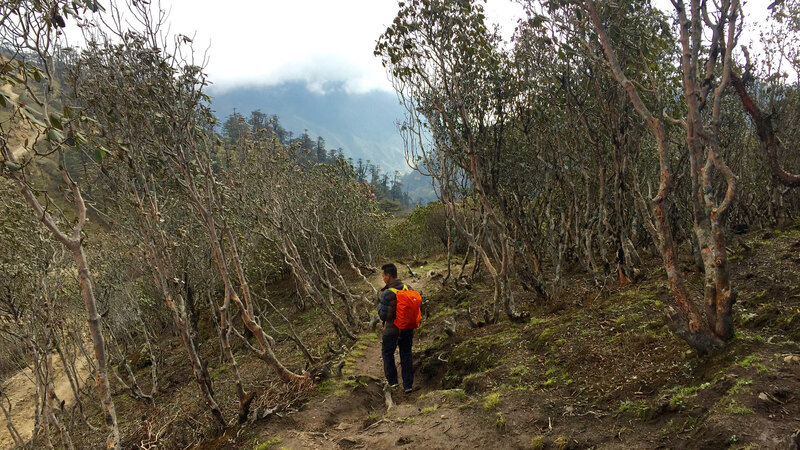 The trail till Phalut does not have any shelter from the elements except for Sabagram (3530 m) which is 4 hours away. The rain here can become a deadly hail storm and there has been unfortunate fatality in the past. 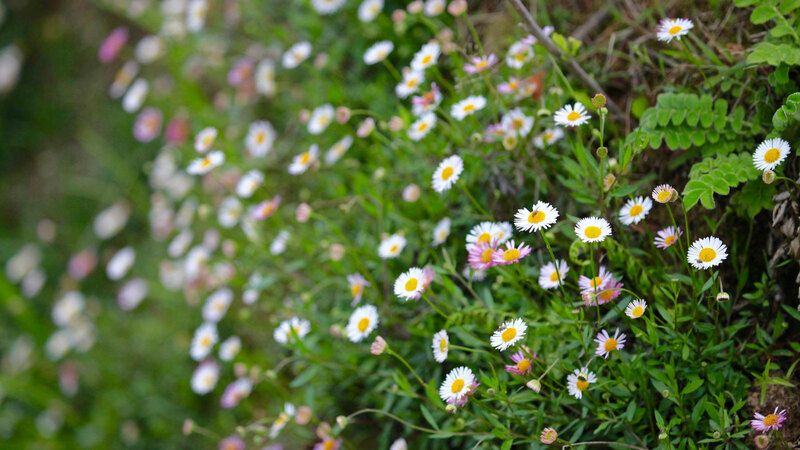 But luckily it did not rain but the weather remained windly and cold . 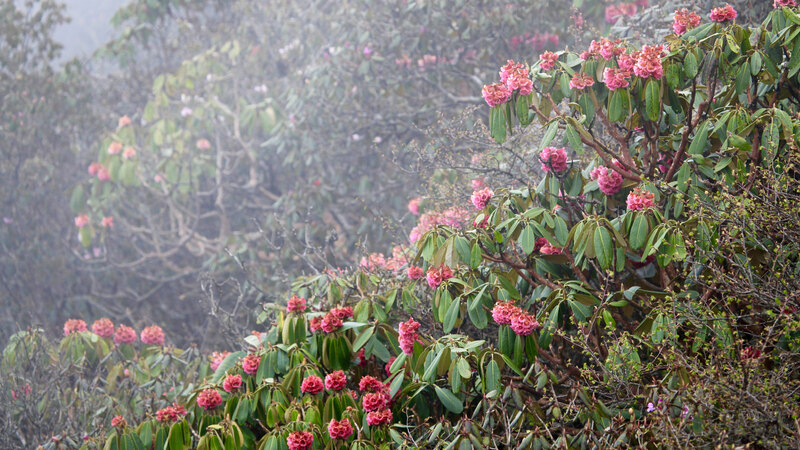 After moving through the initial rhododendron forests, the trail passes through alpine meadows for an hour or so and then enters a jungle trail. 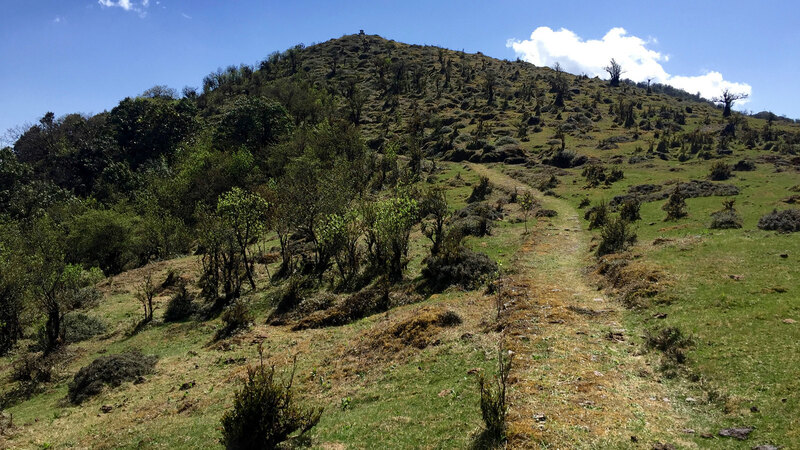 The last trail is steep and ends again at Sabagram which is a meadow. It took us 4 hours to reach Sabagram where we had lunch. 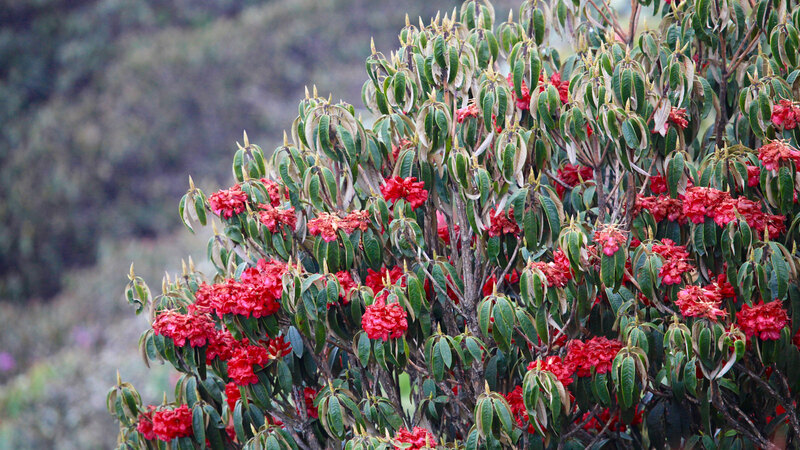 From here its 2 hours walk though rhododendron forests and views ( on a lucky clear day ) to Phalut. 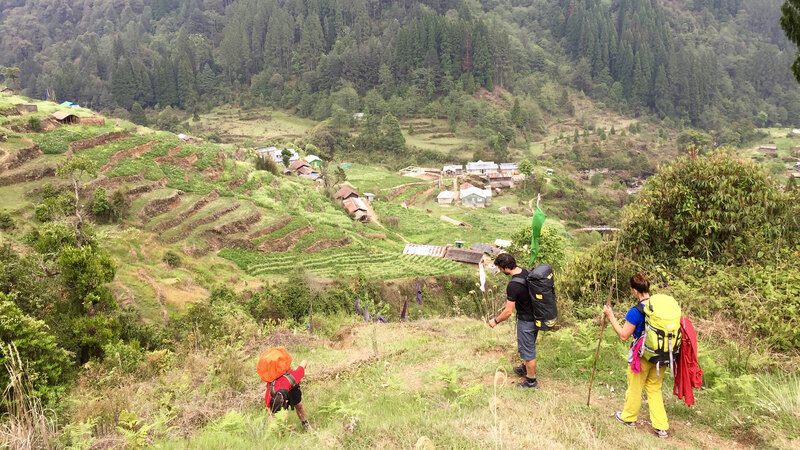 The end of the trail is steep and climbs for a couple to kms to the trekkers hut at Phalut. 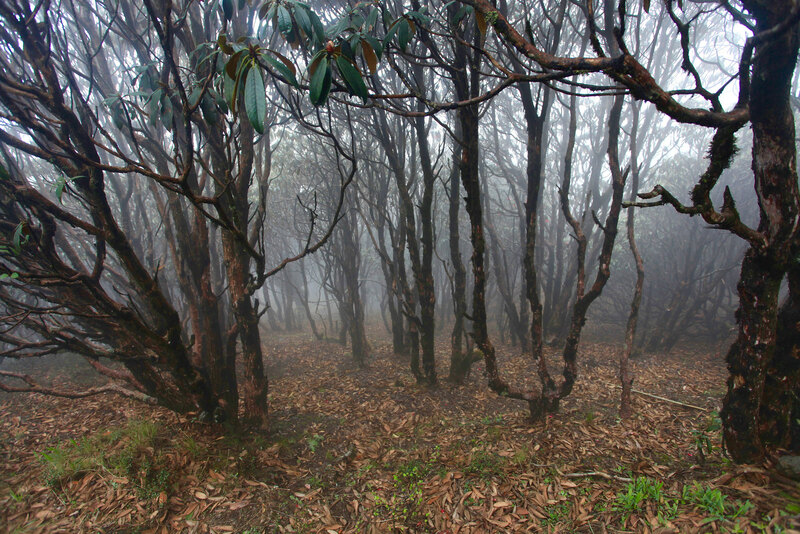 When we reached Phalut, the visibility due to fog was down to few feet. Yogen got me a bed in a room booked by a different group. We were first to arrive at the hut, with groups started arriving. From the hut one has to climb to the top, which takes 30 minutes. But this never happened for us as the weather never cleared and soon after dinner we were asleep. 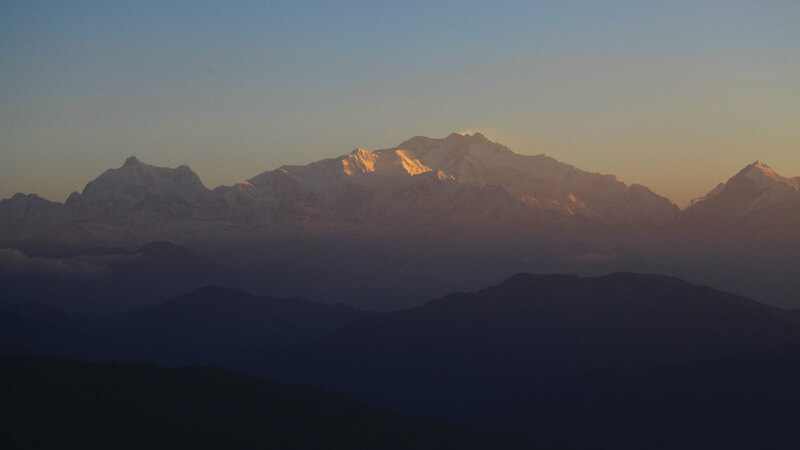 Everest from Sandakphu. 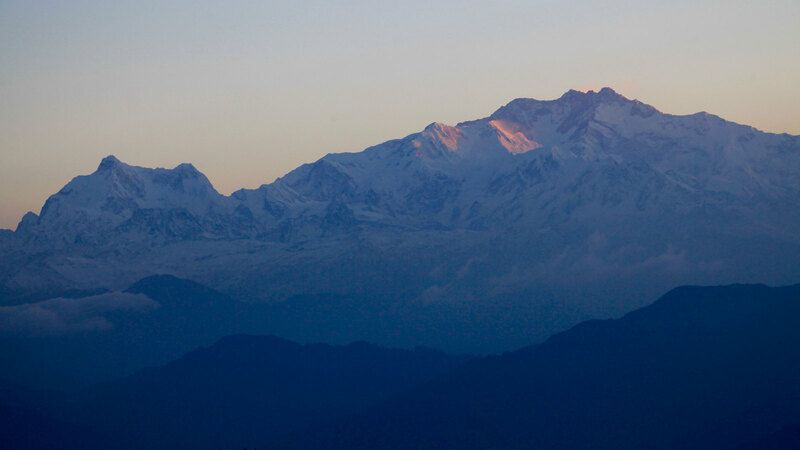 Makalu is known as “Throne of Gods” and now you know why. The scene never changed the next morning. 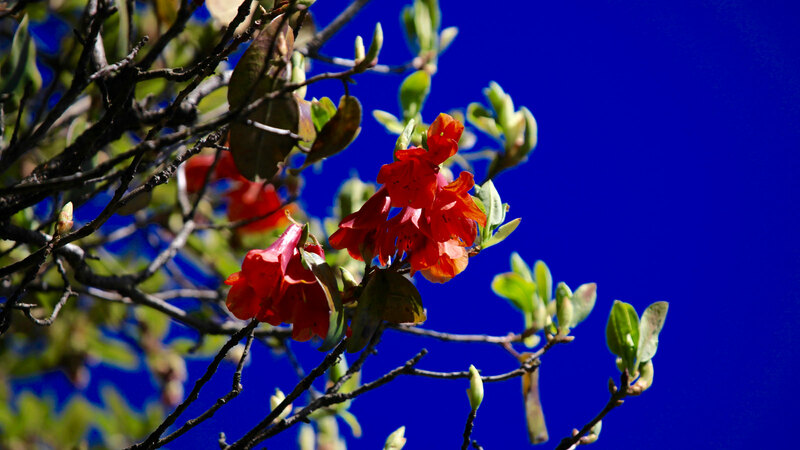 The weather remained dark and cloudy. After breakfast, we started moving down to Gorkhey – Samanden. 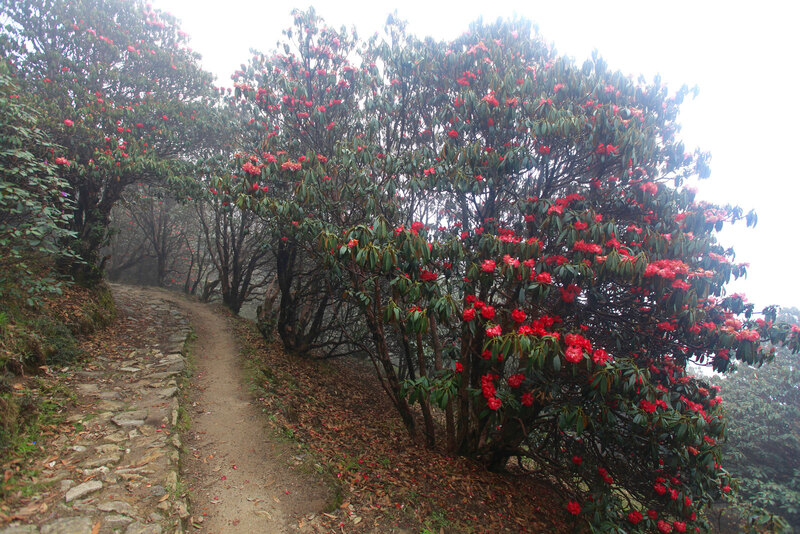 Today is a easy but steep climb down all the way through rhododendron and bamboo forests. 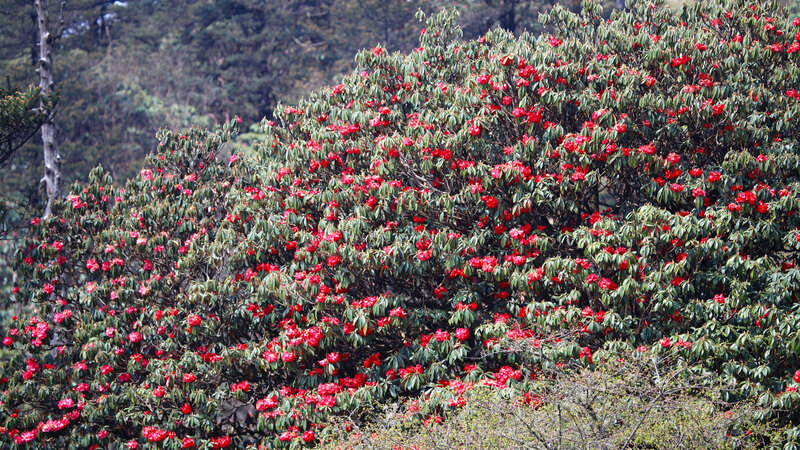 The rhododendron forests are stunning and all colored to the brim. Enroute in the forest, we found a huge yak and stopped as it was standing right on the trail. After some time it moved into the forest and then we moved ahead. Male Yaks are known to chase down people and the local guides advised to stay away from this kind of male yak. 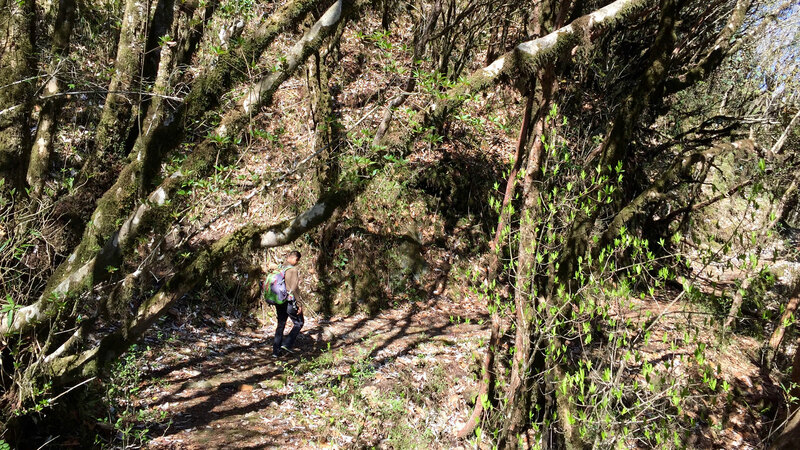 Then while moving down and down, suddenly sound came from the dense bamboo forest and we rushed to find a himalayan black bear down the slopes. We quickly moved away from the spot and moved on. After 3 ½ hours we finally reached Gorkhey (2390 m )located in the confluence of two rivers. Here one side is in West Bengal while other side is in Sikkim. I took rest for a couple of hours and had lunch. And then i moved on for 15 minutes to the village of Samanden (2500 m) which is just above Gorkhey. 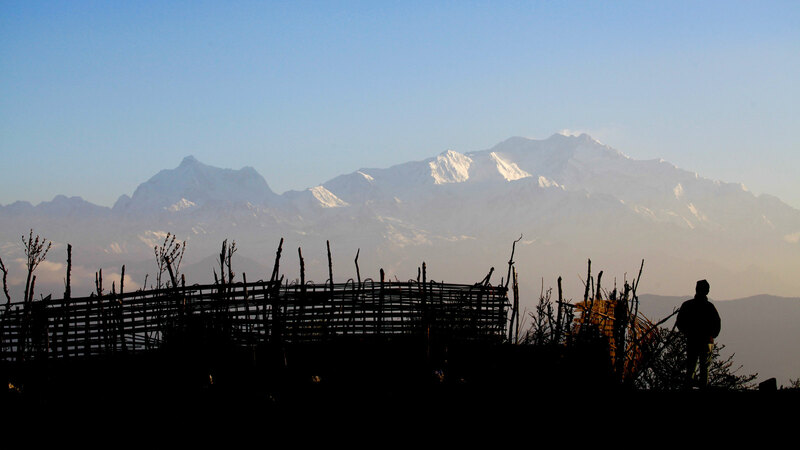 This is undoubtedly one of the most scenic village in the himalayas. I got a beautiful hut for Rs 300 and then spent the day at leisure. In the evening the weather again turned bad and then the deadly hail storm started. It lasted for an hour and if someone is out then i can imagine what can happen. Most of the people stay at Gorkhey which is at the confluence. 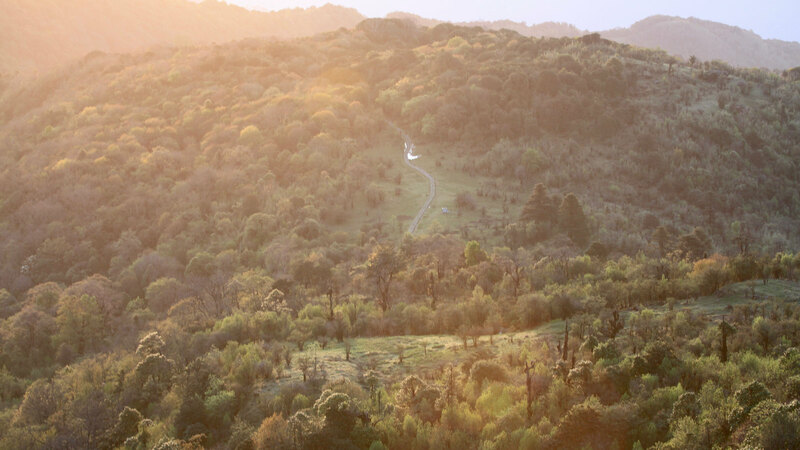 But if you ask me, Samanden is undoubtedly a located in a awesome setting beneath the hills. 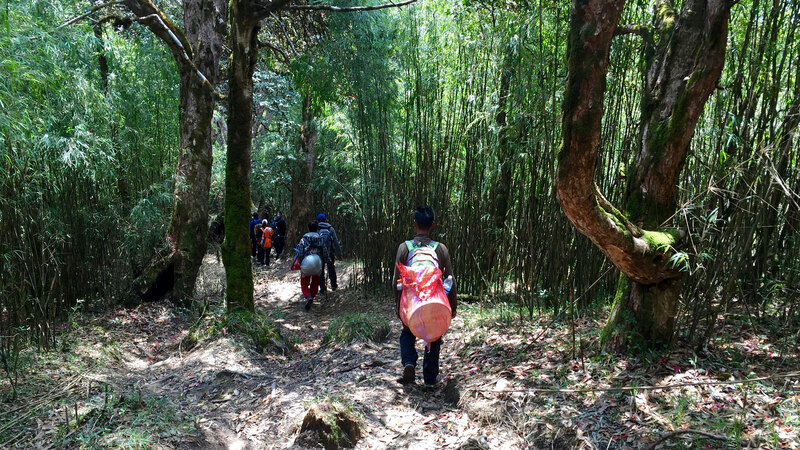 Surprisingly i was the only trekker in the village while all other groups were below in Samanden. The final day and an easy day. The weather is finally clear we again started walking. 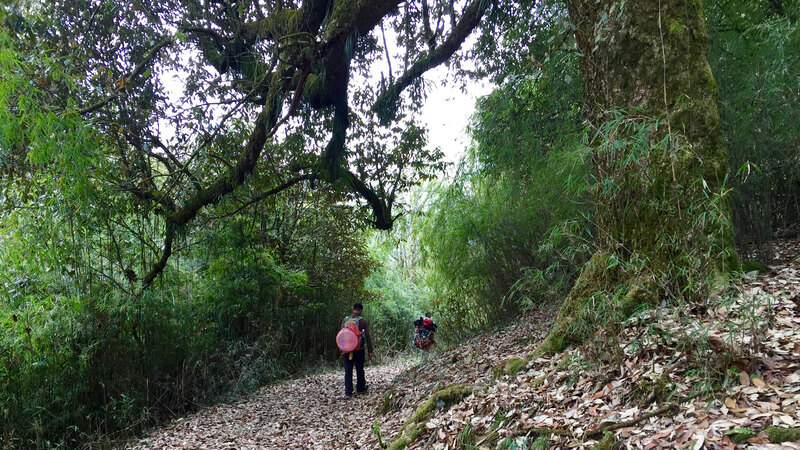 The trail initially climbs down from Samanden though the forest and then gradually climbs up throgh the jungle to the small village of Raman ( 2530 m). I just had tea before i started walking at 7 AM. After 1 hr we reached Raman. The breakfast of fried rice was tasty. 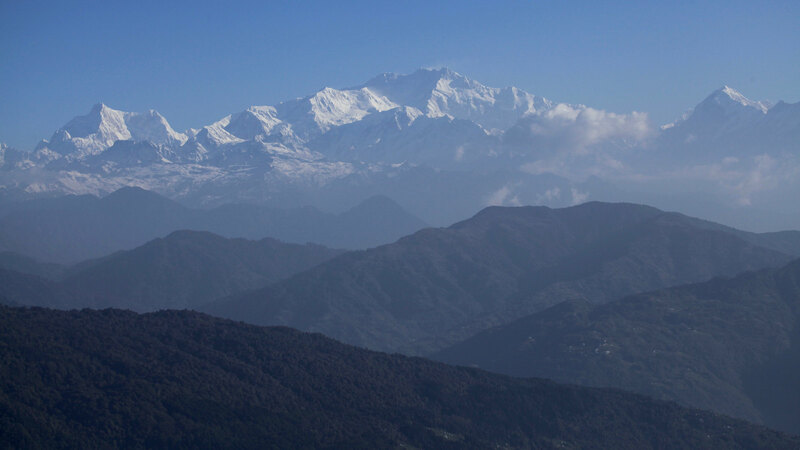 From here one can see Kanchenjunga. 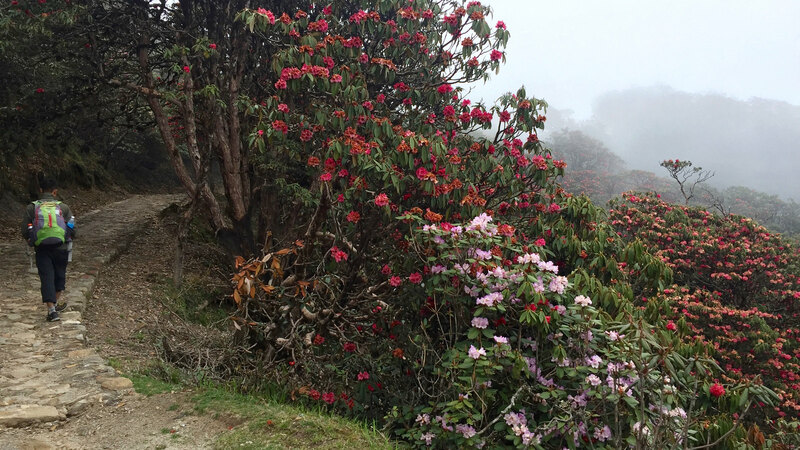 The other side of the valley is Sikkim. Also the distant villages and roads are visible from Raman. The phone finally works here. At present in 2017 there is a dart road all the way upto Raman and i saw a jeep standing just couple of minutes from the village. So essentially you can end your trek here. 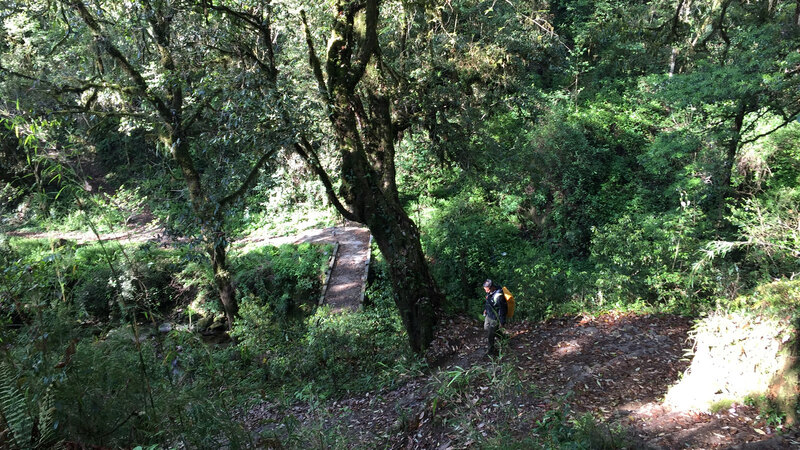 We continued to walk and reached Srikhola at 9:30 AM and the trail is all downhill. Finally the trek has ended. 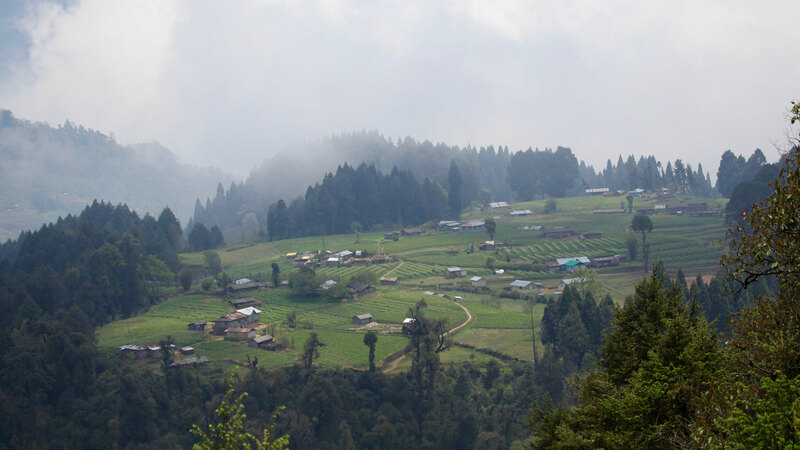 The jeep we saw near Raman will come down and pick us up till Rimbik where we will take another taxi to Darjeeling. We reached Rimbik at 10:30 AM and then spent 3 hours waiting for the next taxi. We finally started at 1:30 PM and reached Darjeeling at 6 PM. Yogen left us at Manebhanjyang and then it was just waiting to reach back home. Winter months have snow but best views of mountains. 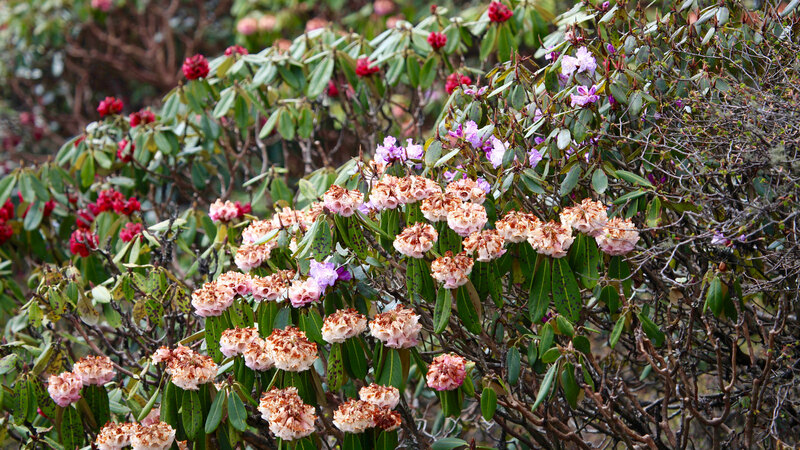 Spring is best for rhododendron and long day and warm weather. 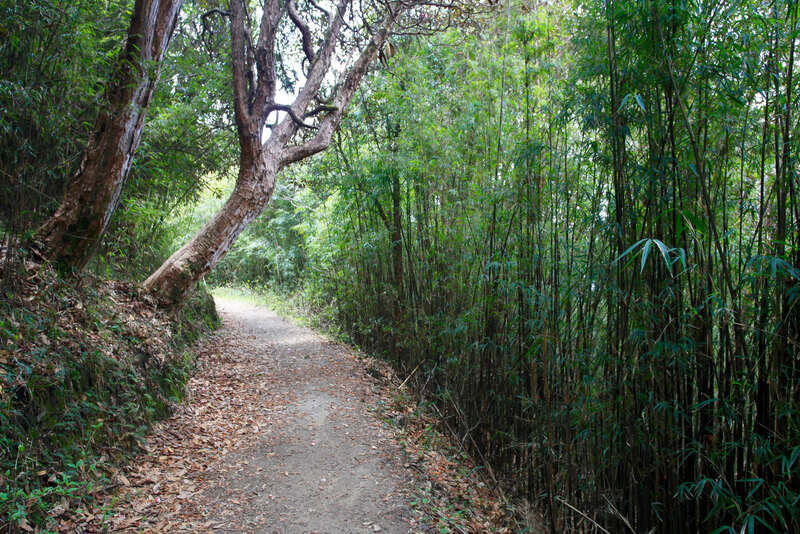 A guide is mandatory in the trail. 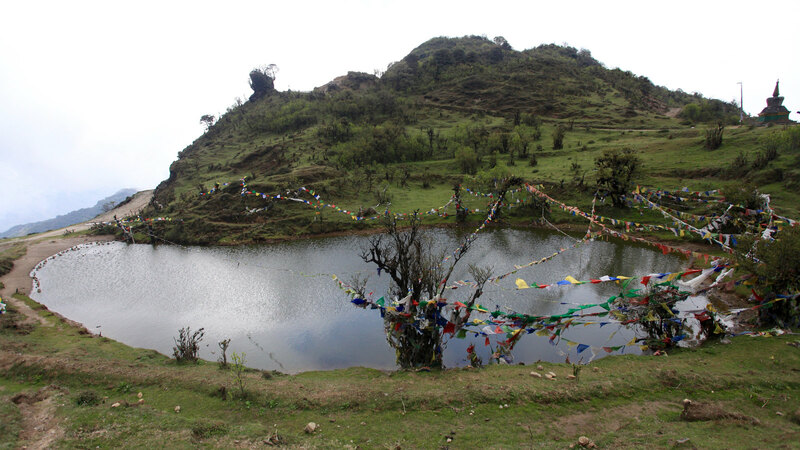 Reach Manebhanjyang before 2 PM to get a guide and start the trek on same day. 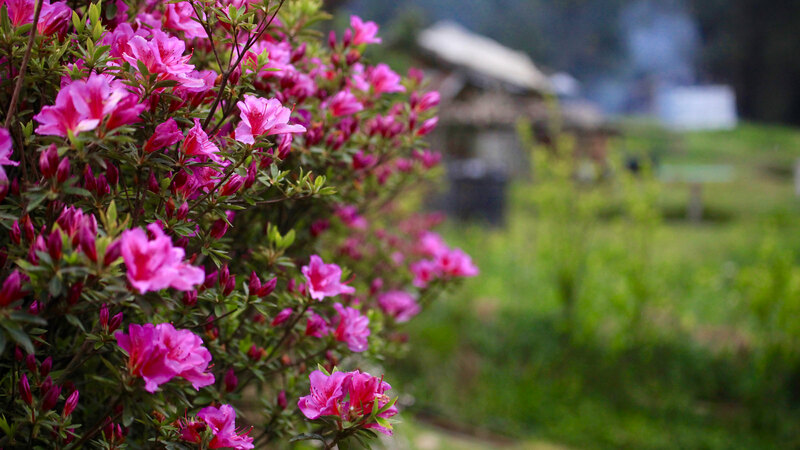 This is a teahouse trek and accommodation available at all location. Expect rush in April – May but even then its is easy to find a place to sleep. Reaching Manebhanjyang: No direct shared taxi is available from NJP Station or Bagdogra Airport or Siliguri Bus Stop (Tenjing Norgey Bus Stop). Take a auto to Tenjing Norgey Bus Stop from NJP Station or Bagdogra Airport. 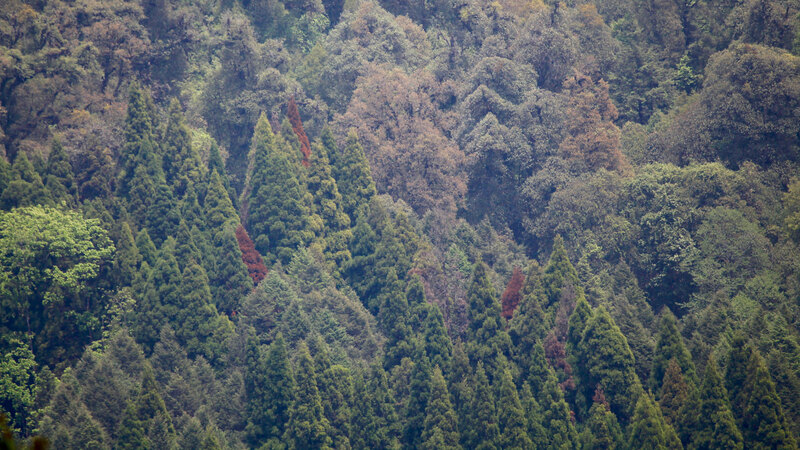 From here take a shared taxi going to Darjeeling. Get down at Ghoom Station. From here (front of Central Bank of India just opposite to station) get a shared taxi to Sukhiappokhare also called Sukhia. From here take a shared taxi going to Manebhanjyang. There are ATM at Sukhia and fill up the cash for the trek here. 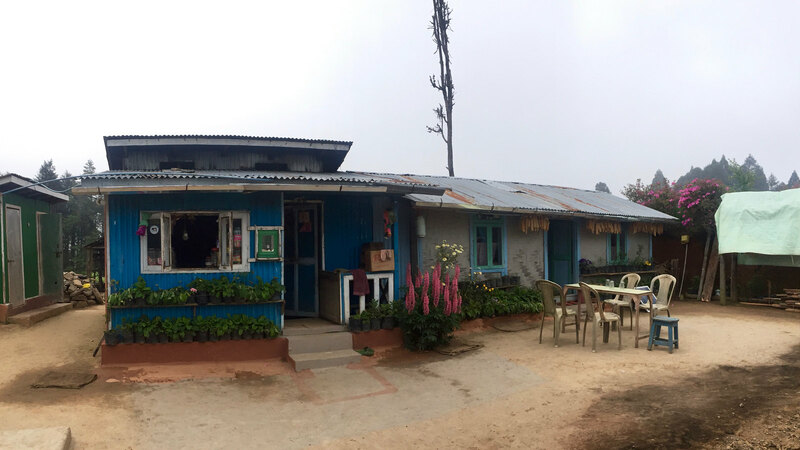 Leaving Rimbik: The last shared taxi leave at 12:30 PM everyday from Rimbik for Darjeeling. Hence reach accordingly at the end of the trek.